AWV sunshades give architects the utmost flexibility in aesthetic choice to beautify the building’s appearance, while providing a degree of solar shading. 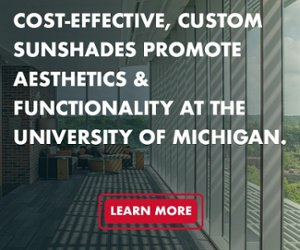 We offer an extraordinary range of sunshades in a variety of shapes, finishes, and mounting arrangements to allow for dynamic architectural effects. We offer a wide range of shapes, patterns, and sizes for blades or fill-in panels, outriggers, and facia styles. Browse our Sunshades below, and contact us today to discuss your specific project's needs.